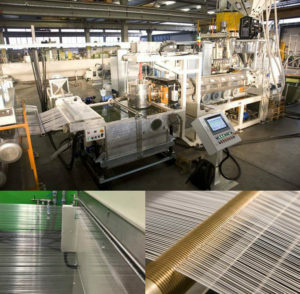 From 5 to 9.02.18 at headquarters in San Vittore Olona (MI) we have under testing a line to produce HDPE monofilament for textile application in the agricultural sector. Filament diameter 0.23 mm (410 den). The line consists of feeding and dosing system for granules, single-screw extruder 90/30 D with a maximum capacity of 150 kg/h, continuous screen changer, circular die with interchangeable molds, stretching at hot water, stabilization oven at hot air, Godet of stretching and stabilization, winding machine with 408 collection points of which 400 in work. Total length of the line 49 m, speed 140 m/min, installed electric power 251 kW.